General Stilwell, who despised both British and Chinese (and the current American, except Marshall) leadership, wanted to fight the Japanese with Chinese troops, in Burma or in China. Roosevelt, while having no interest in rebuilding the British Empire, was at the same time incapable of seeing the Chinese Kuomintang regime as fascist as it really was. He often wanted to sack Stilwell for repeatedly reporting on Chinese incompetence and corruption. Chiang Kai-Shek was more interested in getting his hands on the valuable lend-lease supply the US was sending him through Stilwell, who he hated, than fighting the Japanese. He was not keen on putting Chinese troops under Stilwell's command in Burma since they might become well trained and then possibly turn on Chiang. But he accepted doing so if Stilwell used them for opening up a supply route to China once again. Churchill was not interested in Burma at all and wanted to focus on Singapore. Mountbatten, the Supreme Commander in India and Burma, wanted to attack into Burma, but through an amphibious assault further south instead. Wingate (some thought him to be certifiably insane) wanted to land special trained brigades in the middle of Burma and from there reconquer Southeast Asia. General Slim, who had to put up with his rude and querulous colleagues, Stilwell and Wingate; his flamboyant chief Mountbatten; the hopeless and incompetent Chiang Kai-Shek, just wanted to defeat the Japanese there in the north and from there retake the rest of Burma. In the meantime, in 1944, the Japanese, being outnumbered and with hardly any supply, said "enough is enough" and attacked. Why not? It worked in 1942. But this time Japanese hubris met Slim, the best British General of WW2, in the west; Stilwell's well trained and hard fighting Chinese troops in the North; Wingate's Chindit brigades in the middle amongst them; Chinese Yunnan soldiers who, after Chiang finally let them loose, took heavy casualties when investing the Japanese in the east. This time, after many ferocious battles, the Japanese met their Nemesis and were, in the end, utterly defeated. The phases are drawn as chits, so you will not know in what order they will appear, with the exception of the first chit in a Game Turn which is chosen from the first three drawn chits in the previous Game Turn. Both players have a set of four Phase Chits each and they take turns drawing them. The game mechanics are easy to master. The game play may not be. The quality of the unit is the most important feature. Basically it affects four aspects: Not only will a high quality give an edge in combat, it also decides what kind of ZoC the unit is able to exert. The quality will decide how long a unit can be out of supply before attrition strikes, and how capable the unit is to make an operational move (a "double move"). Since ZoC is non-existent except when preventing enemy units conducting operational moves, it is very important which units you position and where you do so. Especially so, if you are uncertain of which phases there remain to be played. The game will also feature my "Active Combat" system. A combat result will have step losses and probably a retreat result. Step losses are straightforward. The retreat result though has to be enforced by the attacker. That is usually not a problem if it is done by a high quality unit. A unit with lesser quality may have to pay with step losses in order to do so. The defender then decides to retreat or to stand fast. If it stays, then it takes step losses, depending on its quality. Before any attack, the Japanese player has the option to get an extra combat shift in its favor (in attack or defense). But it comes with a price. Finally, there will be a two layer Victory Point system. There is a VP track for each player. Some points can be actively acquired by you but are given once, usually those that will please your local commander. Some points can be actively acquired by the opponent and will be deducted every Game Turn from your track as long as the enemy controls them, usually those that displease your superiors. Then again, it is the same thing for your opponent. Those that you have received once are also the ones that are deducted each Game Turn from your opponent's track etc. In the end, as the commander, you will have to prioritize, depending on the current situation. 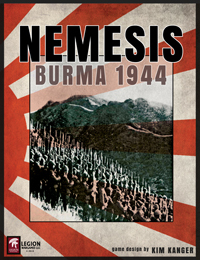 Nemesis has a high replay value and if you love tense games when in action as well as games that allow you to ponder on possible "perfect opening moves", then this is the game for you. Game Map: 22" x 34"
Game Counters: 126 each - .75" and 176 each .6"
Player Aids: 2 ea. 8 1/2" x 11"